I had some pork to use up. 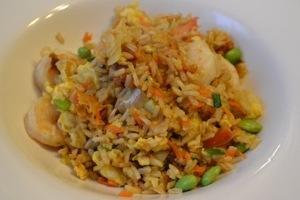 Fried rice sounded good! 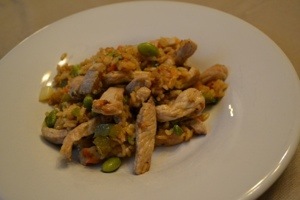 This version was ok… Definitely like the other fried rice I made recently better! Heat 1/2 teaspoon oil in a wok or large nonstick skillet over medium-high heat. Add ginger and garlic; sauté 1 minute. Add pork; sauté 3 minutes or until pork loses its pink color. Place pork mixture in a large bowl; cover and keep warm. Add 1 teaspoon oil to pan. Add edamame and carrot; sauté 2 minutes. Add onions and bell pepper; sauté 2 minutes. Add carrot mixture to pork mixture in bowl; keep warm. Heat remaining 2 1/2 tablespoons oil in pan. Add cooked rice and soy sauce to pan; sauté 3 minutes. Return pork mixture to pan. Stir in broth and next 5 ingredients (through black pepper); cook 2 minutes or until thoroughly heated. Spoon 1 1/2 cups fried rice mixture onto each of 4 individual plates; top each serving with 1 1/2 teaspoons peanuts. The other night I took shrimp out to defrost and had no plans for it. I usually have good luck on the skinnytaste site! And yet again I was not disappointed! This turned out super yummy! I made the brown rice using Alton brown’s baking method. Whisk eggs, season with salt and pepper. In a hot wok, spray a little oil and cook the eggs. When cooked, remove from pan and set aside. Let the wok get really hot. Add oil and sauté shrimp until done. Remove shrimp and keep warm. In same pan add a little more oil. Add onions, scallion whites, carrots and garlic for about 30-60 seconds, careful not to burn. Add brown rice and stir well a few minutes to heat through. Add cooked egg along with soy sauce, scallion greens and edamame, mixing well for about 3-4 minutes. Add in shrimp and and mix in. Place the rice into an 8-inch square glass baking dish. Bring the water, butter, and salt just to a boil in a kettle or covered saucepan. Once the water boils, pour it over the rice, stir to combine, and cover the dish tightly with heavy-duty aluminum foil. Bake on the middle rack of the oven for 1 hour. After 1 hour, remove cover and fluff the rice with a fork. Serve immediately. 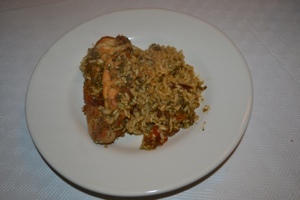 I first had arroz con pollo in Puerto Rico years ago. It was delicious. This recipe came out good, tasted nothing like the arroz con pollo I’ve had in the past though… I used brown rice since the only white rice I had was sushi or basmati rice. Husband liked it. I thought it needed more flavor. Season chicken with vinegar, 1/2 tsp sazon, adobo and garlic powder and let it sit 10 minutes. Heat a large deep heavy skillet on medium, add 2 tsp oil when hot. Add chicken and brown 5 minutes on each side. Remove and set aside. Place onion, cilantro, garlic, scallions and pepper in mini food processor. Add remaining teaspoon of olive oil to the skillet and sauté onion mixture on medium-low until soft, about 3 minutes. Add tomato, cook another minute. Add rice, mix well and cook another minute. Add water, bouillon (be sure it dissolves well) and remaining sazon, scraping up any browned bits from the bottom of the pot. Taste for salt, should taste salty enough to suit your taste, add more as needed. Add chicken and nestle into rice, bring to a boil. Simmer on medium-low until most of the water evaporates and you see the liquid bubbling at the top of the rice line, then reduce heat to low heat and cover. Make sure the lid has a good seal, no steam should escape (You could place a piece of tin foil or paper towel in between the lid and the pot if steam escapes). Cook 20 minutes without opening the lid. Shut heat off and let it sit with the lid on an additional 10 minutes (don’t peak!!!) Fluff with a fork and eat! 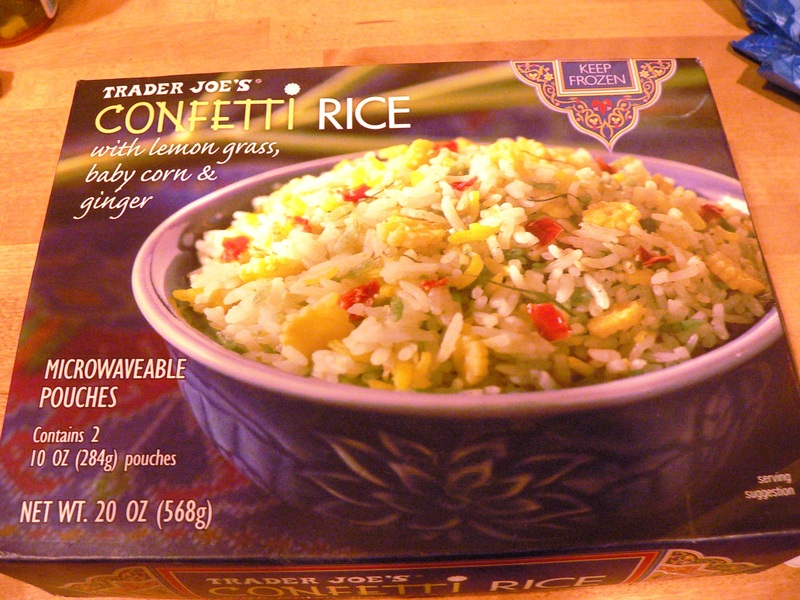 we had leftovers tonight — but for a side we cooked up some tj’s confetti rice. if you shop at tj’s you must try this rice! delicious! last night some good friends came over for dinner and since it was a saturday i had more time than usual to whip up a meal.. although now that i think about it – none of the components really took longer than 30minutes or so anyway. but it was nice to have the time to prep/chop beforehand and then throw everything together at the end. 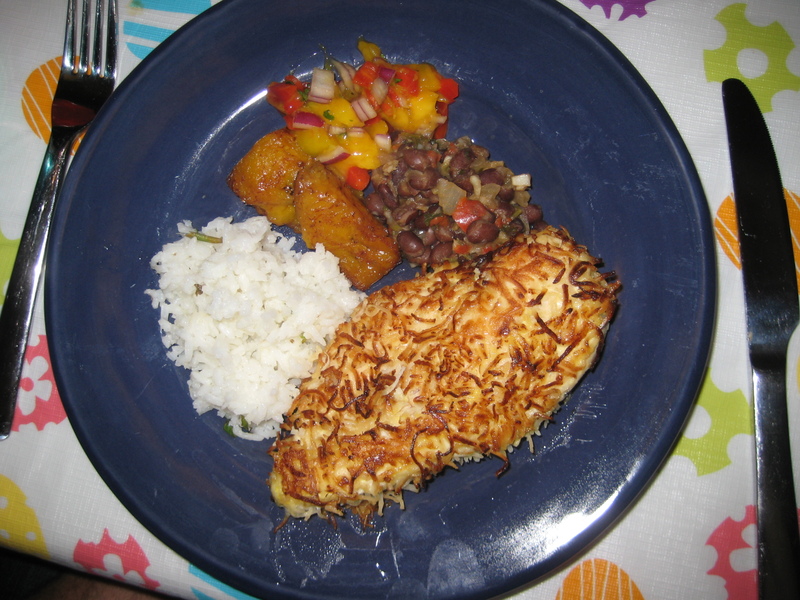 RR’s coconut-crusted chicken with mango salsa, Cilantro lime rice, cuban style black beans, and some plantains. this was my second time making the chicken. the first time i made it with regular sweetened shredded coconut and this time i followed the recipe using unsweetened. 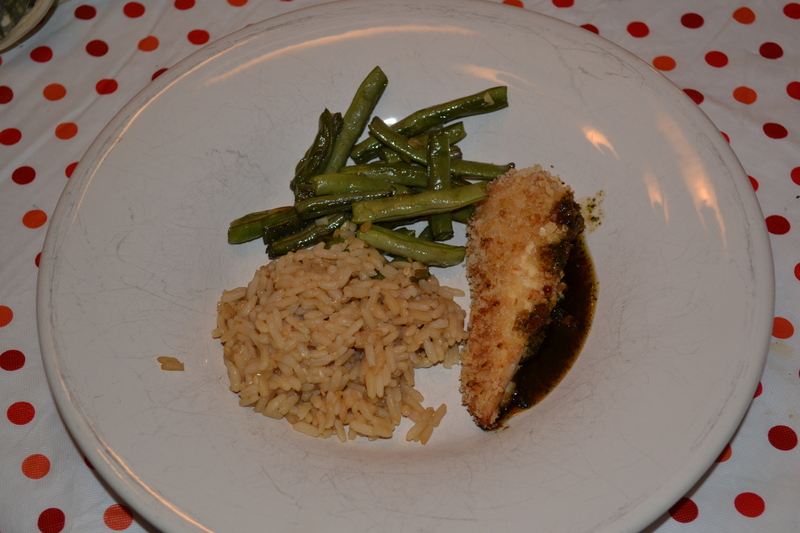 it was definitely better the first time with the sweetened… just added a little bit more flavor to the dish! Preheat the oven to 350°. In a small bowl, combine the mango, bell pepper, onion, cilantro and vinegar; season with salt and pepper. In a shallow bowl, beat the egg with 1 teaspoon water and 1/2 teaspoon salt. Place the coconut in another shallow bowl. Dip the chicken in the egg, then in the coconut. Press to coat. In large, ovenproof skillet, heat the oil over medium-high heat. Add the chicken and cook, turning once, until golden, about 3 minutes. Transfer the skillet to the oven and bake until cooked through, about 12 minutes. 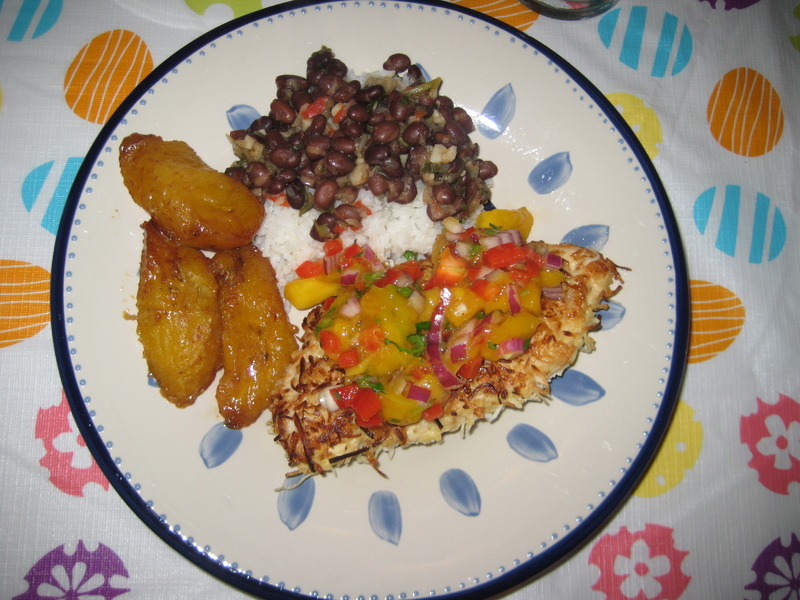 Serve the chicken with the mango salsa. In a small heavy pot, add rice, water, 1 tsp oil and salt. Boil on high until most of the water evaporates. When the water just skims the top of the rice, reduce to low and cover about 15 minutes. Shut off flame and keep covered an additional 5 minute.In a medium bowl, combine chopped cilantro, lime juice, rice and remaining oil and toss until completely mixed. Chop onion, garlic, scallions, red pepper, and cilantro in a mini chopper of food processor. Add oil to a medium-sized pot on medium heat. Add vegetables to the pot and saute until soft, about 3 minutes. Add beans, water, bay leaf, cumin, oregano, red wine vinegar, salt and black pepper and bring to a boil. Lower heat and cover, simmer about 15 minutes stirring occasionally (adjust water as needed). Taste for salt and serve.